A new bridge is being built across the Cumberland River, and, the other day, I drove across it for the first time. I guess that means I drove across it twice. First, I went over it. Then, I came back. It was that return trip that I noticed our county seal displayed prominently. This took me by surprise because I have lived in Wilson County all of my life and had never seen it. Heck, I did not even know it existed. However, that was not the only thing that surprised me. It did not look like a typical seal. Most seals that I have seen have symbols that represent the area. There may be some sort of plant that grows in the area. There may be a farmer. There may be some representation of industry. 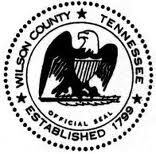 The Wilson County seal looks like something you would see at the post office. The bald eagle is patriotic, but I have not seen many bald eagles around here lately. It made me think that this must be a more recent creation. The seals with crops, farmers and industry are from a time long past. This one looks more modern. With this on my mind, I called the Wilson County Archives to find out when this seal came into being. They had no idea but agreed that it must come from more recent times. Anyway, I am on a mission to find out when the Wilson County seal was created and why it does not represent anything special about the area. It is American, but it is not Wilsonian. That brings me to something that has bugged me for a long time. Why is Wilson County named Wilson? I know why our city is named Lebanon. The settlers saw all of the cedar trees and thought of the Cedars of Lebanon in the Bible. Unfortunately, they are not cedars. They are junipers. Here is something else. Lebanon, Oregon is named after Lebanon, Tennessee. Some guy from here hopped on the Oregon Trail and named his new town after his old one. That means there is a city in Oregon named for a city in Tennessee that is named after the wrong kind of tree. Now, back to Wilson. The county is named for Major David Wilson, a prominent man who lived in Sumner County. That is the county that sits on the other side of the new bridge. He was born around Charlotte, North Carolina and fought in the American Revolution. He settled in these parts, which was the western part of North Carolina, and involved himself in many activities of a landed gentleman. Politician, surveyor and other jobs that do not require strenuous labor. I am sure he was a great man. Wilson County was named in his honor in 1799, a few years before his death. However, I am wondering something. Did he ever make his way across the river and into the land that would bear his name? Did he own property here? Did he help create the new county? What role did this man play in our county’s history? It is like the seal that really does not represent anything about Wilson County. Did the man who it is named after represent the county? I guess it does not matter, but it still makes me wonder. I always wonder about this stuff too. When you mentioned Sumner County I said WHOA, a connection? Maybe related to the guy after whom is named the Sumner Tunnel in Boston? Alas, apparently not. The tunnel is named after William Sumner, the son of early Mass governor Increase Sumner. But keep hunting. I love this stuff. Who knows what cool historical trivia you may uncover? And maybe American eagles USED to live there. You know what happened to the cedars of Lebanon? Tyre sold ALL of them to Solomon who used them to build the Temple in Jerusalem. I wonder which Sumner out neighboring county is named for. I don’t know what I’ll find out, but I’m going to find out who came up with that seal. I wonder if the cedars in the Bible were really junipers. WOW ! 2 other people that wonder about things ! In school I’d sit there with all this stuff being shovelled at me … that I was supposed to memorize … for some reason … and my mind would mercifully go blank. Zen style. Most folks don’t wonder about nuthin’. Those are the people running the place. If we don’t wonder about things, then we won’t learn anything.